TEEMING rain, snow-capped mountains and freezing cold conditions in the middle of November. Daunting? Not for the Toyota LandCruiser Prado. Sitting in the heart of the Snowy Mountains, this is the birthplace of Toyota's rugged off-roader family. Sir Leslie Thiess first imported Cruisers to work on the hydro-electric scheme back in the 1950s. Being a land of extremes, we're the ultimate test bed for the LandCruiser. Chief engineer Sadayoshi Koyari says the motto is: "If it can survive in Australia, it can survive anywhere". 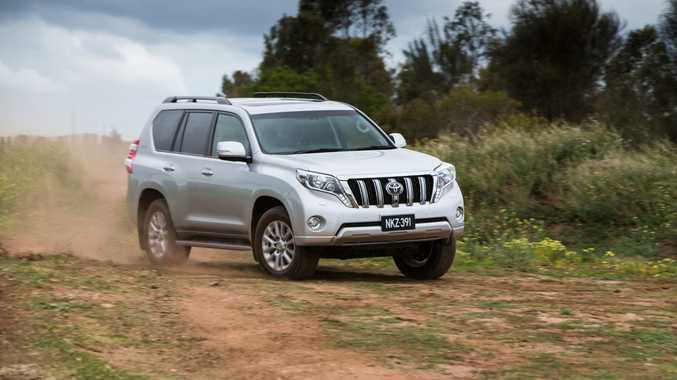 The latest chapter in the Japanese brand's presence Down Under has just been written with the upgraded LandCruiser Prado. It arrives in a trimmed line-up, down to 11 variants after the three-door was canned due to slow sales. There are a host of tweaks inside and out, with the same petrol and diesel drivetrains carried over. The entry-level GX remains $55,990, but all other models have increased retail prices. Range-topping Kakadu models have risen the most, $1455, which lifts the bottom line to $91,590 for the petrol and $92,590 for the oil-burner. One thing that has not been altered is the exceptional space. Five adults can appreciate the first two rows and, while the third row is best left to children, smaller adults can cope for shorter trips. Getting into the third row is now easier courtesy of a wider seat fold angle (from 33.8 to 46 degrees). For the driver there is a new-look speedometer and tachometer on GX and GXL. These grades have an LCD multi-information display. Up-spec VX and Kakadu variants have a groovier three-dimensional design with thinner white needles and blue illumination around the edges. While many of the changes may appear superficial there are some vital new inclusions under the skin. Probably the most important is trailer sway control. Given the proliferation of Prados towing around the country it's a pivotal safety feature. The technology helps suppress swaying that can be caused by crosswinds, poor roads and sharp steering. Whether on the open road or the beaten track, the Prado feels at home. Quiet and smooth, covering big distances is done with ease. Both the petrol and diesel variants lope along beautifully on the highway with minimal fuss. brief while also being able to get down and dirty bolsters the Prado appeal. It features some outstanding off-road technology, which enables drivers of all ability to tackle challenging terrain. While expensive, VX and Kakadu models fitted with the Kinetic Dynamic Suspension System make mince meat of arduous terrain. It now has a new setting, "rock and dirt", which is one of five available for various conditions. With a range of cameras and aids you can confidently face beaten trails, steep ascents and difficult descents. Even when you can't see the road, with the bonnet pointed skyward, you can make use of the cameras and vision on the central display where you can see tyre track projections to find the perfect line. All Prados have cruise control, rear view camera, air-con, Bluetooth phone connectivity and maximum towing capacity of 2500 tonnes. Tow ball rating is 250kg. The GLX sits mid-spec and accounts for about 70% of Prado sales. It adds tri-zone air-con, rear parking sensors, a third row of seats and upgraded internal finishes. Stepping up into the VX and Kakadu range really enters the luxury realm with all the bells and whistles such as leather trim and the 3D look driver set-up, but most notably gain the KDSS system - although only the Kakadu gets a rear differential lock with Crawl function. With average fuel consumption of about nine litres for every 100km, it's no wonder the diesel accounts for about 95% of Prado sales. Servicing is capped at $210 for each maintenance visit for the first three years or 60,000km. Toyota also has an excellent dealership spread. LandCruisers also traditionally hold their value well and their longevity is highly regarded. There is no mistaking it's a Prado coming at you. Now boasting deeper front bumper, new light clusters that are positioned higher and a more prominent grille with five striking vertical bars. It's big, burly and muscular. Two new external colours have been added to the eight-hue palette, including "Dynamic Blue" and "Liquid Bronze". Details: Five-door seven-seat large four-wheel drive sports utility vehicle. Engines: 4.0-litre V6 petrol generating maximum power of 202kW @ 5600rpm and peak torque of 381Nm @ 4400rpm; 3.0-litre four-cylinder turbo diesel 127kW @ 3400rpm and 410Nm @ 1600-2800rpm. Transmissions: Six-speed automatic or five-speed automatic. Consumption: Petrol - 11.5 litres/100km; Diesel - 8.5L/100km (a), 8.8L/100km (m). CO2: Petrol - 271g/km; Diesel - 225g/km (a), 232g/km (m). What we liked: Ability to eat up the kilometres, comfortable ride, internal space and comfort, off-road prowess. What we'd like to see: Powertrain advancements, the 4.5-litre turbo diesel from the 200 Series, improved off-road tyres. Warranty and servicing: Three-year/100,000km warranty. Services are $210 each for the first six services, they are required every six months or 10,000km.